← Passing on the Bauble. In her recent memoir, All in My Head, about dealing with the chronic pain of continuous headache, Paula Kamen talks of the long and circuitous journey she took to find effective medication, and of the turn to alternative treatments that followed the constant failures. Alternative medicine, she writes, “appealed precisely because it was not Western medicine, which I had grown to revile and fear” (p.114). I’ve been thinking about Kamen’s search for relief over the past week, as I’ve been researching the treatments available to people with migraine in the very early years of the eighteenth century. Historians of medicine are used to talking about the ‘medical marketplace’ but Kamen uses a different phrase to describe this world: as the ‘marketplace of ideas’ (p.115). L.L. Boilly, Snuff-takers (n.d.) Credit: Wellcome Library, London. From the late seventeenth century, after the lapsing of the Printing Act which had controlled publications since the Restoration, English makers and sellers of medicines took full advantage of the new media freedom to widely advertise their wares in cheap early newspapers such as Post Boy and the Daily Courant. It is all too easy to dismiss theatrically-titled nostrums such as ‘the most Noble Volatile Smelling Bottle in the World’, and the ‘Capital Liquid Snuff’ as over-priced and ineffectual goods being shamelessly and cynically flaunted by quacks, charlatans and showmen. But as the late Roy Porter observed in Health for Sale, his groundbreaking history of the eighteenth-century medical marketplace, ‘so long as disease remained powerful, so did all forms of healing’ (p.25). Neither should we dismiss these powder-purveyors as marginal to a more ‘orthodox’ or official medicine happening elsewhere – for many people this was medicine, particularly in the urban metropolis. The link between medical remedies and the print revolution was about more than what appeared on the page. Adverts always gave customers precise instructions about where their ‘exquisite’ remedies could be found. As an experiment, I spent an afternoon last week on the wonderful Locating London website, mapping where different migraine remedies could be purchased in London between 1698 and 1738. The results were striking: the London geography of proprietary medicine overlapped almost exactly with that of journalism. Virtually all these remedies (as the detail from John Rocque’s 1746 map of London shows below) could be found along the Strand and Fleet Street, with clusters of sellers around Charing Cross (better known now as Trafalgar Square), St Dunstan’s Church on the Strand and the Royal Exchange on Cornhill. Detail of John Rocque’s Map of London (1746) showing the location of migraine remedy sellers from 1698-1738. Image credit: Wikipedia. So what kind of world did a person enter, when they went on to these streets to purchase some ‘Medicinal Snuff’? Doing so with a throbbing megrim would have been a daunting prospect. This was a strange and hectic part of town, where marvellous animals, contortionists, giantesses, street-sellers and fire-eaters vied for the attention of passers-by. 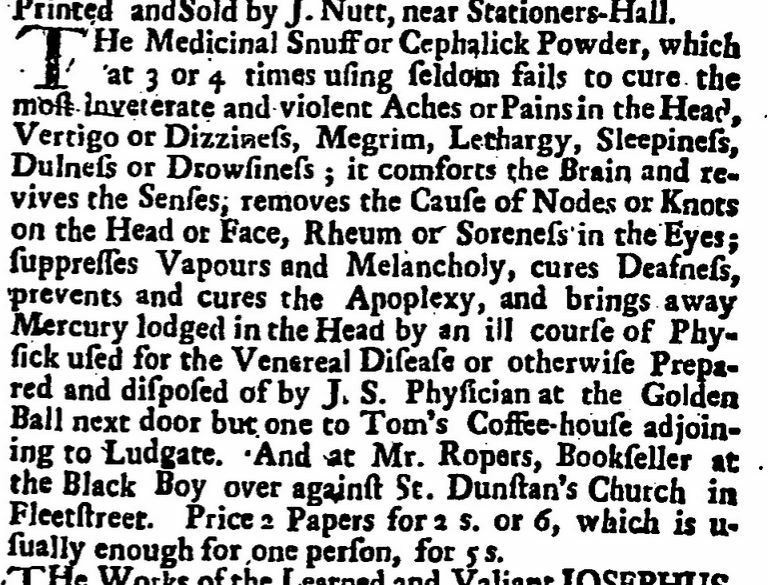 Migraine remedies were sold by a variety of tradespeople: in 1718, a customer could purchase Dr Lower’s purging Cordial Tincture with their cabbage from Mr Leening’s grocer next to Little St Helen’s Gate, from Mr Hobson the distiller, with their coffee from John in Swithins Lane, or indeed from Mr Ford the bookseller in Poultry. To find a remedy in a darkened alley tavern, the dimpsy gloom of a toyshop or smoky coffee house, one would have to negotiate the fetid gutters that ran through the cobbles, the shouting hawkers and the jostling population of this urban jungle. Medicines have improved, no doubt. But we still have no cure for migraine. And so in our own day, many sufferers still find themselves entering a strange and murky world of pills & promises. As Kamen says, ‘the absurdity wasn’t that the “cures” were alternative and increasingly offbeat. It was that, in my desperation and hope for a magic bullet, I would almost always try them’ (p.178). It occurs to me that we might also usefully think about a long history for the ‘marketplace of hope’.